An extremely rare whale has had a remarkable escape after becoming entangled in a tuna boat’s nets off the coast of Pakistan on February 10th. Usually, the whale’s fate would have been sealed the moment it got entangled in the fishermen’s gillnets, which are notorious for the number of animals that they unintentionally trap and kill – particularly whales and dolphins. But after a thirty-minute battle, the whale was safely on its way – thanks to the efforts of the captain and crew, who had been trained by WWF-Pakistan to rescue endangered species that accidentally end up in their nets. It is the first time that any whale has been successfully freed since the training programme began two and a half years ago. 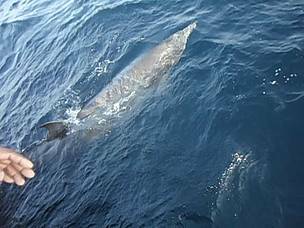 And what makes it even more extraordinary is that the whale has been identified as most probably a Longman’s beaked whale (Indopacetus pacificus) – one of the rarest species of whale in the world and one that has never been recorded in the seas off Pakistan before. Launched in 2012, the initiative has provided training to many tuna fishermen so that they know how to release threatened large species from their nets. 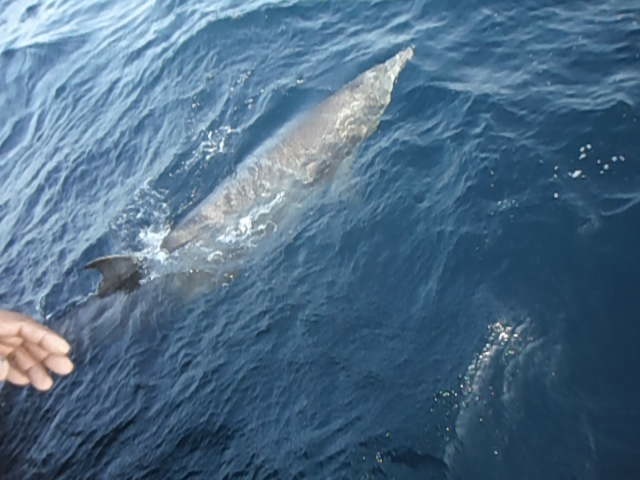 So far 15 whale sharks, 3 manta rays and 2 sunfishes have been rescued from gillnets – and now a Longman’s beaked whale as well. 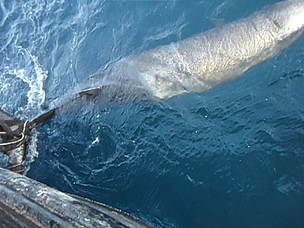 The distribution of the Longman’s beaked whale is not fully known, but it appears to be limited to the Indo-Pacific region – primarily the waters between South Africa, Somalia and Sri Lanka. However, there is very little information about the species because of its rarity. But this unique sighting shows that its range is more extensive than previously thought. And gathering new data like this is an important component of the project. Along with the training, WWF-Pakistan has posted observers on tuna boats operating in the North Arabian Sea and this has already produced considerable information about key by-catch species, including turtles, sharks, dolphins and manta rays. “Not only are the fishermen trying hard to release endangered species from their nets, but their efforts are also providing us with data that will help us to protect our ocean’s biodiversity,” said Muhammad Moazzam Khan, WWF-Pakistan Technical Advisor for Marine Fisheries. With a gillnet wrapped round its tail, this whale (most probably an extremely rare Longman's beaked whale) would not have survived without the help of the WWF-trained crew. It took 30 minutes for the crew to successfully release the whale from the gillnet.